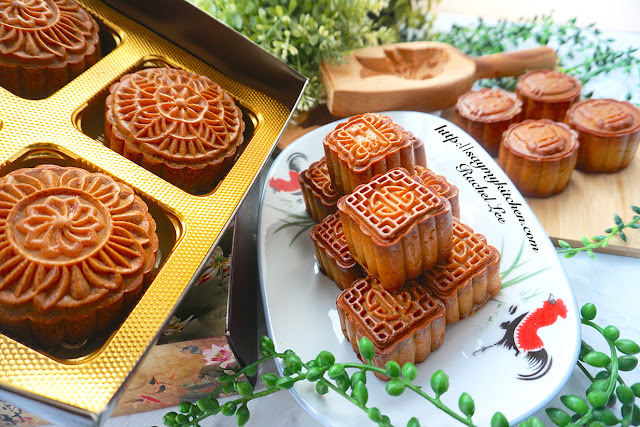 There're few mooncake photographs that were updated in September 2017. 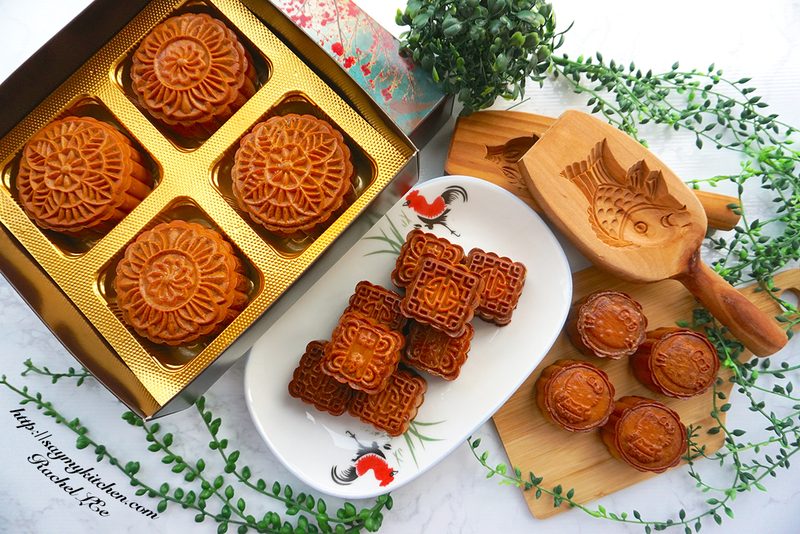 Our mooncaking adventure began when retail prices for mooncakes soared higher each year. 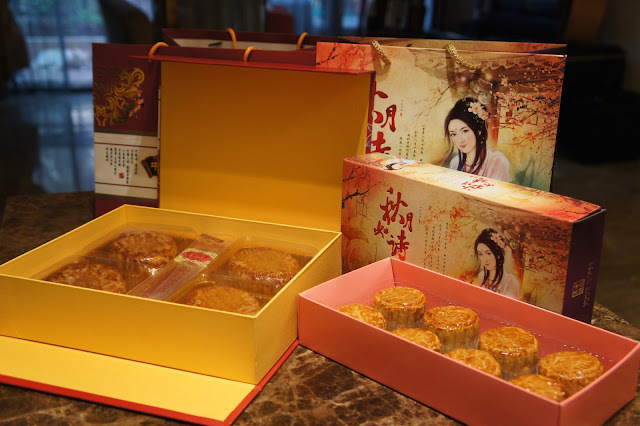 For own consumption, we thought the Homemade Traditional Mooncakes 传統莲蓉月饼 would make more financial sense. 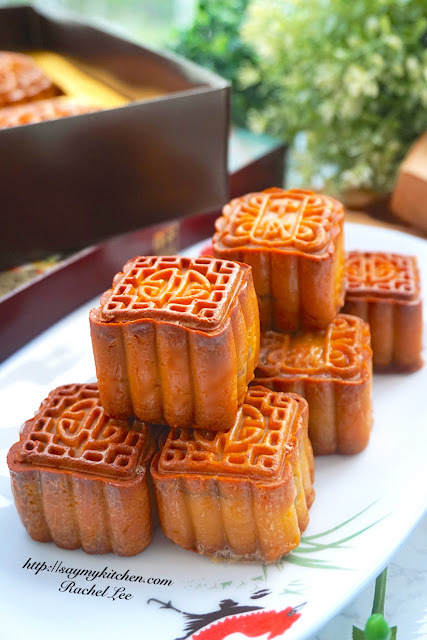 After all, my husband and I find it really fulfilling to make mooncakes for our beloved family during our couple bonding time! There are few common sizes for mooncake moulds ranging from 50 gm (mini size mooncakes) to 150 gm (normal standard size mooncakes). Occasionally, we may come across odd sizes. 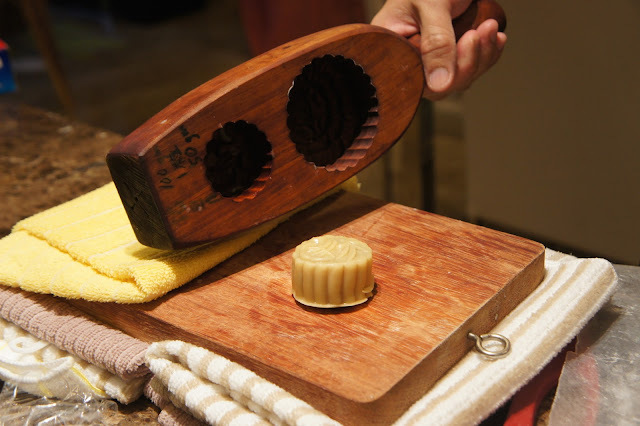 For instance, I have one oval shape wooden mould that has an odd size of about 200 gm, much larger than the norm. Hence, take note that ingredients portioning vary in accordance to mould size and shape. 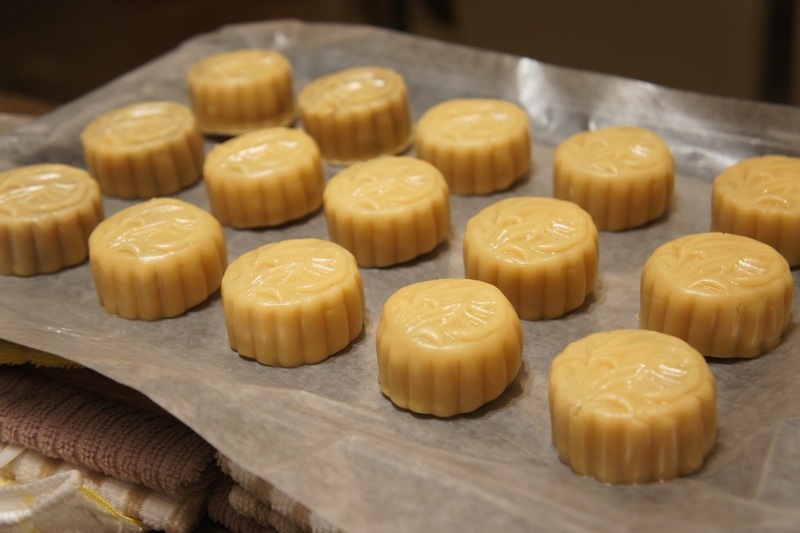 Tip 1 : Many websites give us recipes based on their own mooncake moulds. They may or may not work for our own mould(s). How do we determine the portion for crust and filling for our own mould(s)? 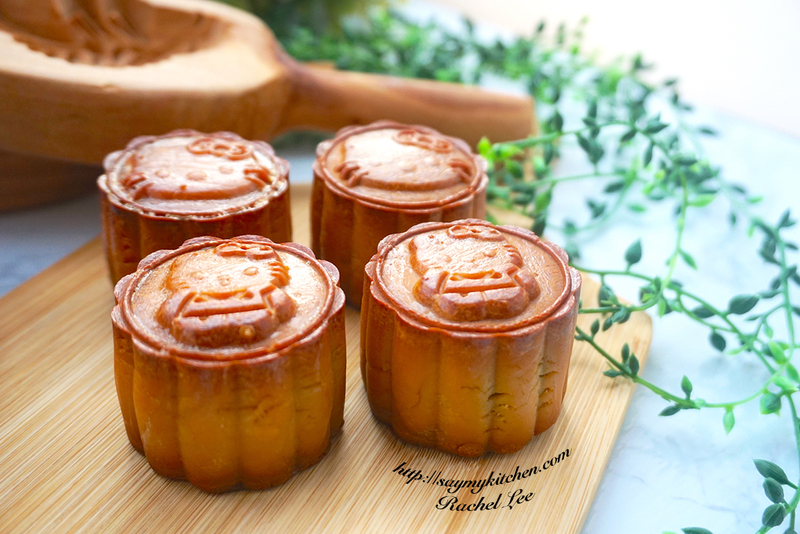 Fill the mooncake mould with dough (i.e. after mixing flour, peanut oil, golden syrup, alkaline water). Dislodge the whole dough from the mould. Check weight of dough that was dislodged (e.g. our round mooncake mould yielded exactly 150 gm). Decide on the ratio for our crust and filling. After a few trials, we were comfortable with ratio +/- 3:7 (3 being the crust; 7 being the filling) or 4:6 (4 being the crust; 6 being the filling). We made our own adjustments in accordance to our different mould shapes. 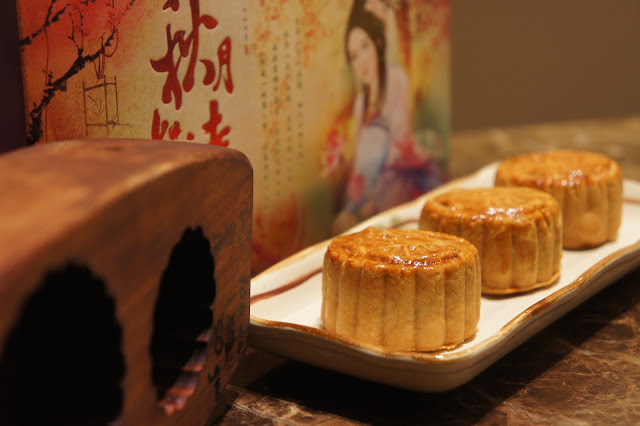 For our 150 gm round mould, we did 100 gm filling and 50 gm crust (ratio at +/- 3:7). 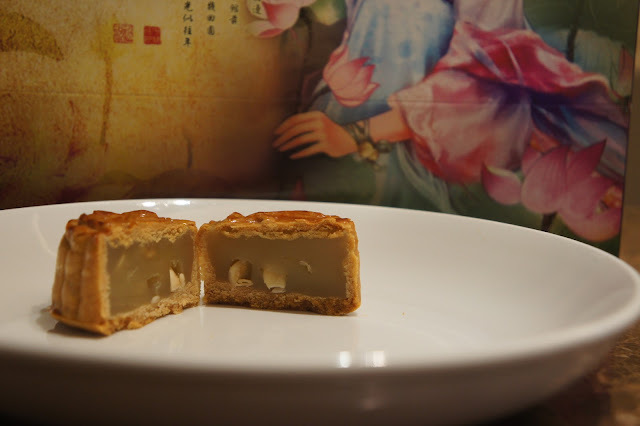 Our filling had melon seeds that weighed about 5 gm for each piece of mooncake. 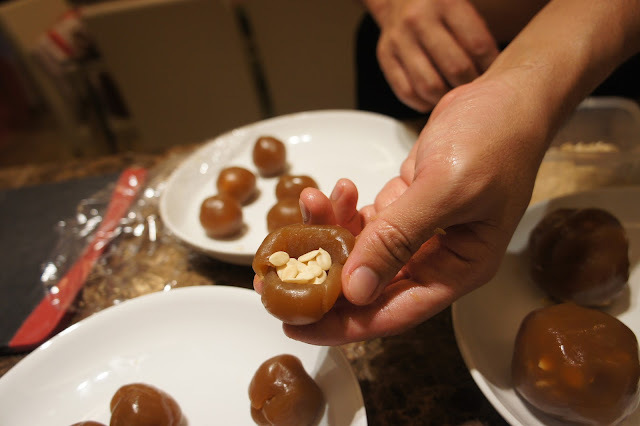 Hence, our lotus paste filling must take into consideration the weight of melon seeds. The same theory applies if you use salted egg yolk. 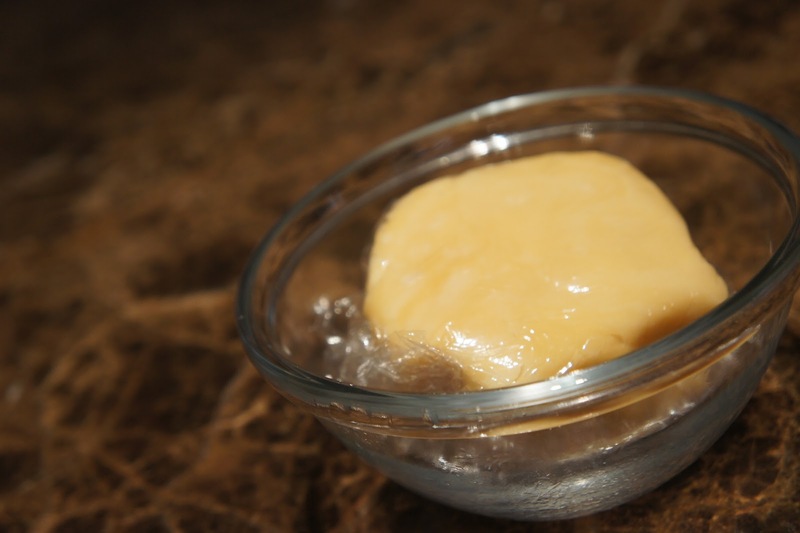 If your egg yolk weighs 20 gm, then remove 20 gm of lotus paste and replace with egg yolk. Tip 2 : Time is the essence for a successful dough. We realised that if we let the dough rest too long (e.g. overnight), the dough would turn flaky. Having tried several rounds, my husband and I derived that the dough works best if we let it rest for 35 to 45 minutes before moulding the mooncake. Try not to delay too long. We went for pre-made "Less Sweet" white lotus paste 白莲蓉. I was told this was imported from Hong Kong. 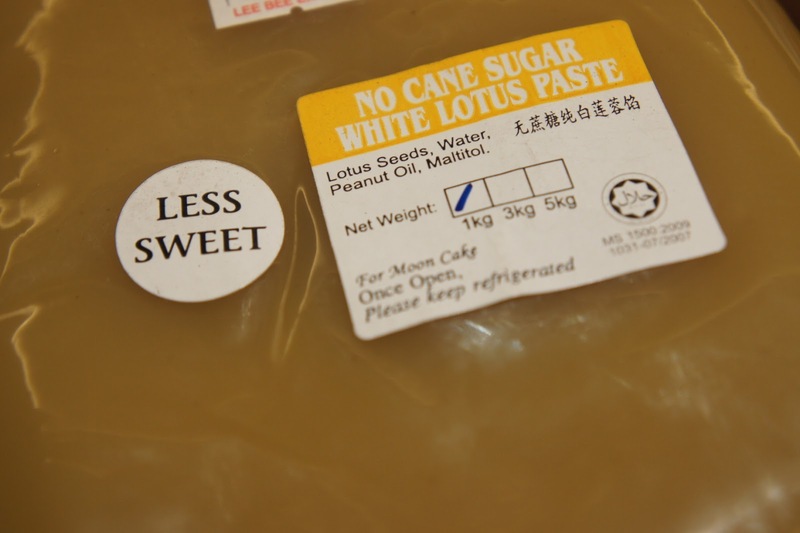 "Less Sweet" traditional lotus paste 黄莲蓉 too. Toast all melon seeds in oven at 175 degrees celsius for 3 to 5 minutes till they start popping in the oven. 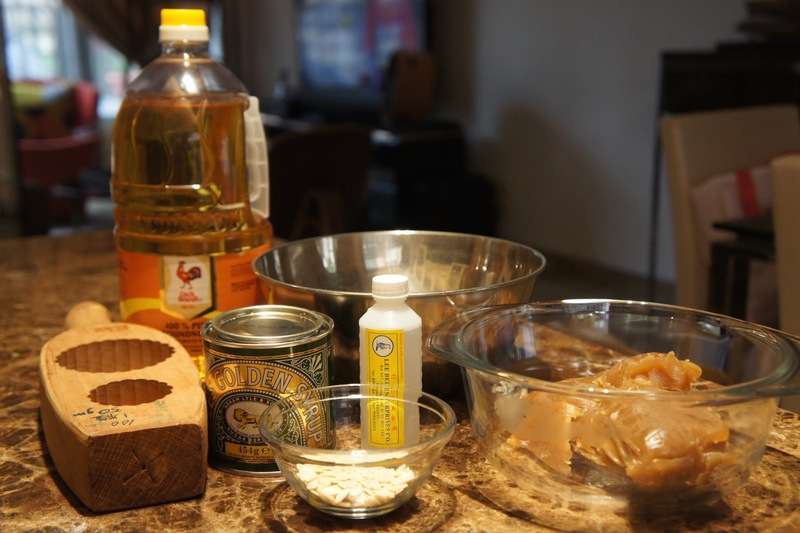 Mix peanut oil, golden syrup and alkaline water in a bowl thoroughly to get a nice crust mixture. Sieve Hong Kong flour into a big bowl, then fold in the crust mixture into big bowl. Mix flour and crust mixture gently and evenly. Do not over knead as we do not want to encourage high gluten that would result in the mooncake crust being tough and chewy. Wrap dough in cling wrap when it's nice and soft. Let it rest at room temperature for 35-45 minutes. 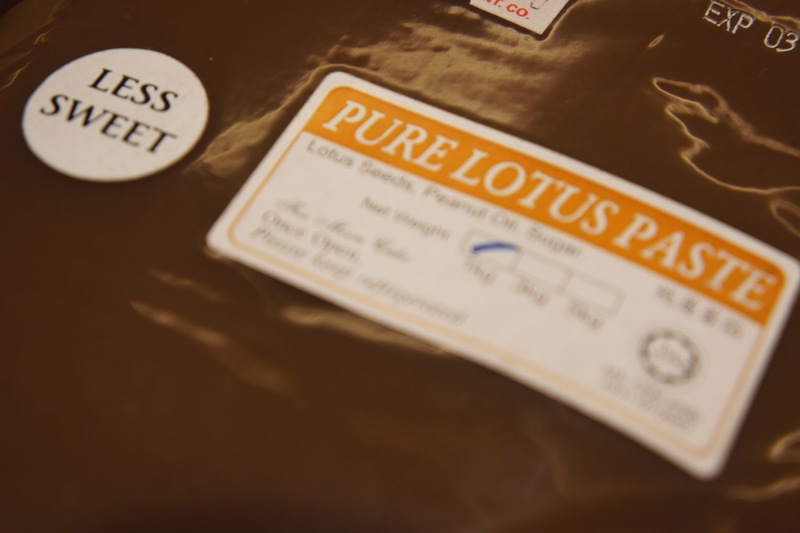 Meanwhile, prepare the lotus paste. Roll lotus paste into several small balls (in accordance to our apportioned weight). 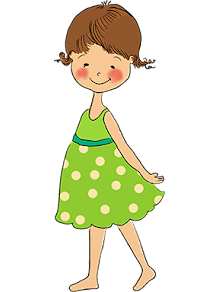 Dig a well on the lotus paste ball. Insert melon seeds or like most people - salted egg yolk. 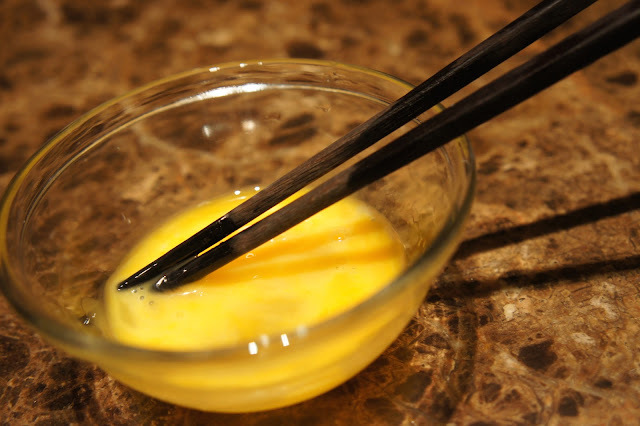 Ensure that salted egg yolk(s) were pre-cooked in microwave oven, oven or steamer beforehand. Knead to close up the lotus paste again. 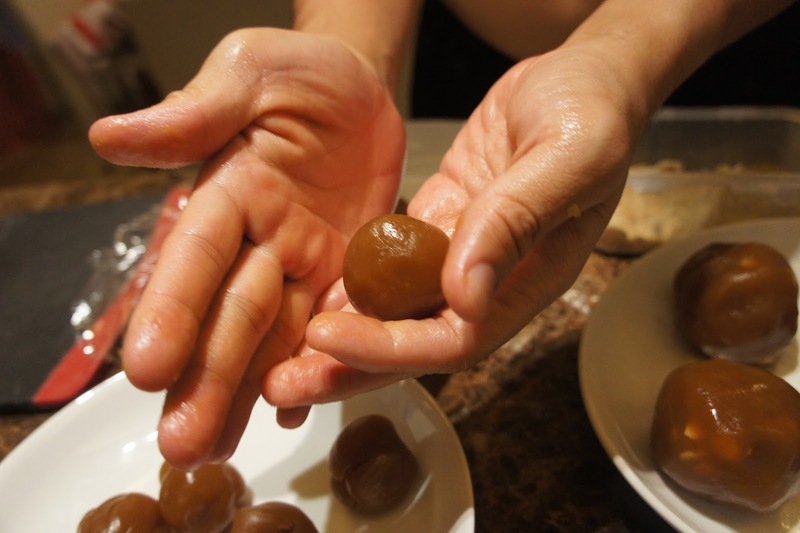 Roll the lotus paste ball in between palms. Put aside when satisfied with shape and texture. 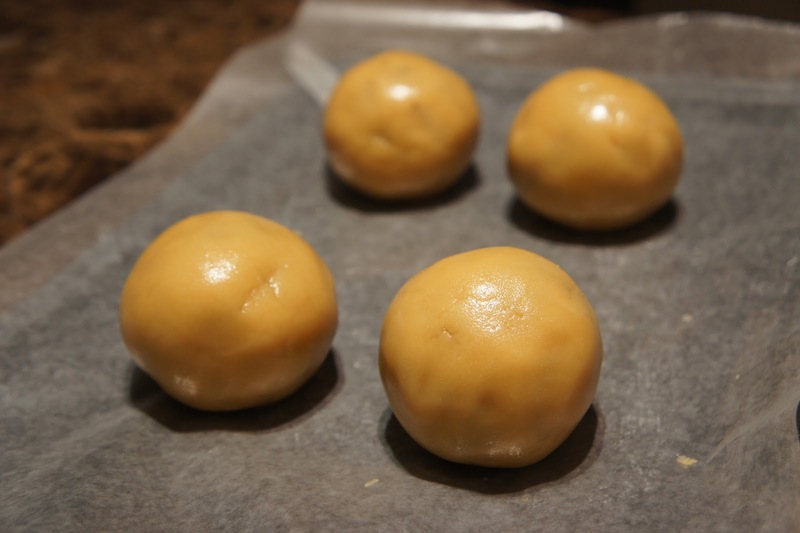 When 35-45 minutes time is due, divide mooncake crust dough into equal portions (e.g. 4 portions for normal size mooncakes or 8 portions for mini-sized mooncakes) with the help of a weighing scale. 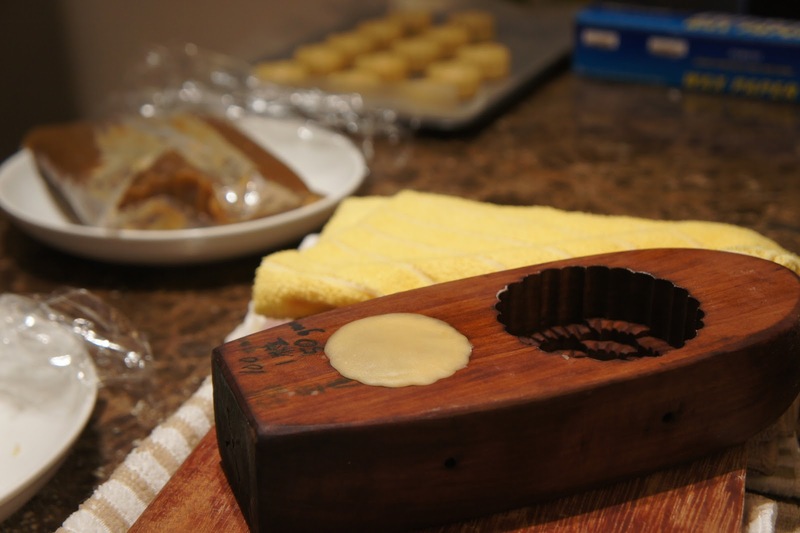 Use palms or rolling pin to press the dough ball flat. 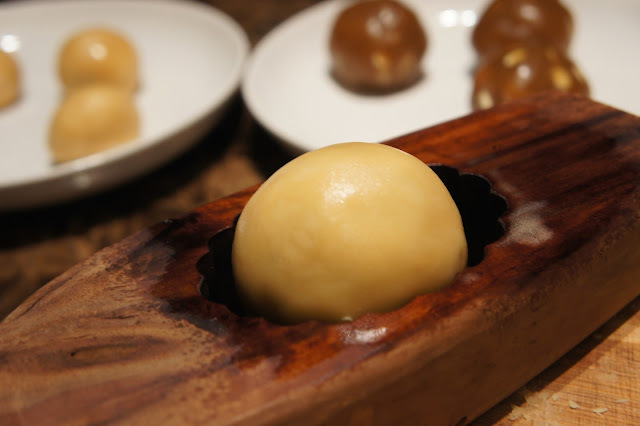 Wrap the lotus paste ball in the flat dough. Then slowly knead to close up the dough. Roll them back into perfect ball shape in between palms. 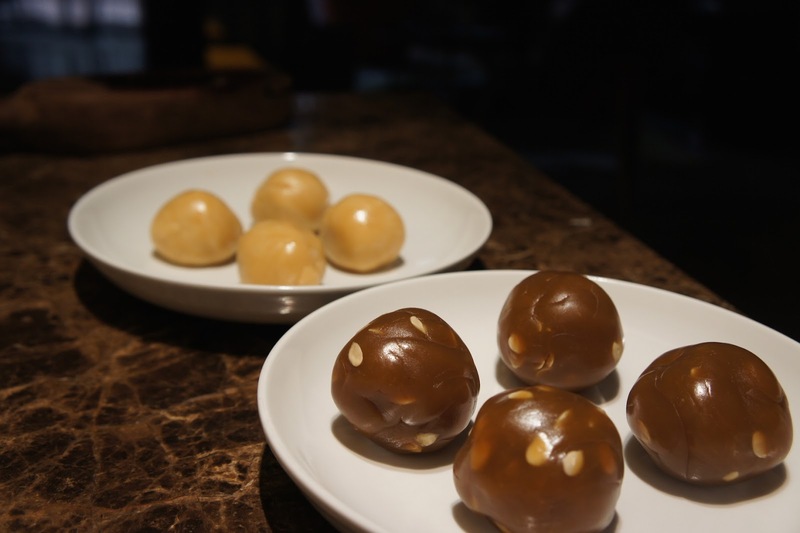 This time, the lotus paste and salted egg/melon seeds inside and the mooncake skin outside. 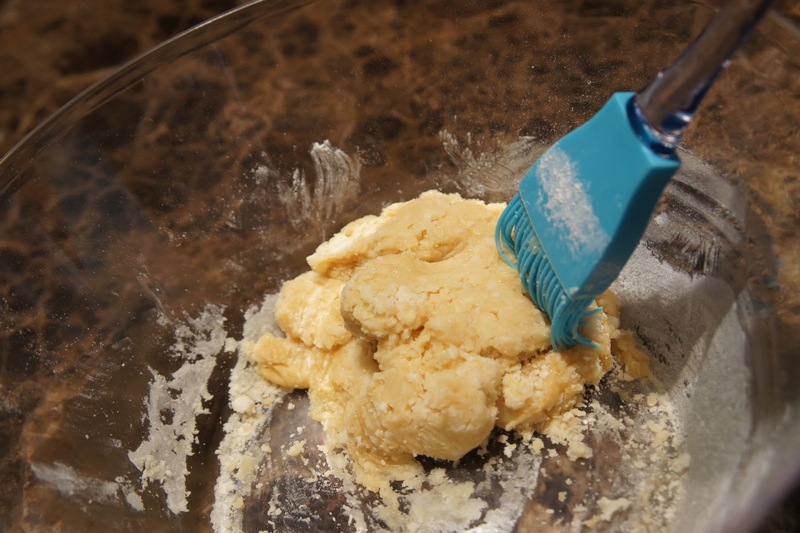 It would help easier dislodgement if we brush a little flour on our palms when rolling the dough balls in between palms. Do in moderation. Avoid brushing excessive flour or the mooncake would be disfigured (the flour would stick onto the surface of the mooncake) when baked. Place one final dough into mould. Remember to soak wooden mould overnight in oil if using for the first time. This oiling and seasoning process would prevent mould from cracking and breaking as we hit to dislodge. Use palm to flatten dough so that entire mould is filled up. We do not need brutal strength. Lightly hit the wooden mould on a hard surface on all sides.The dough would not dislodge if we hit on just one side. 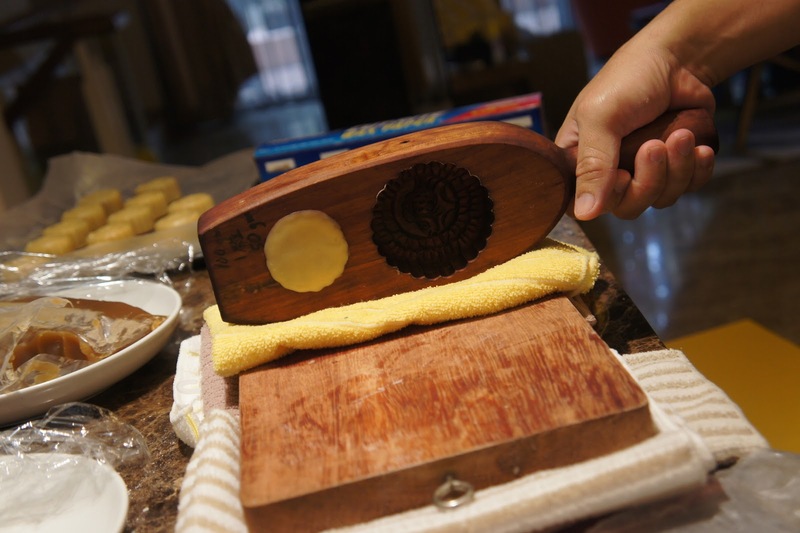 The nicely imprinted dough would loosen and dislodge from the mould on its own. Lay parchment/wax paper on baking tray and arrange imprinted doughs in rows. Leave some space in between each dough. Spray just a little water on the surface of the dough to prevent the crust from cracking when bake. 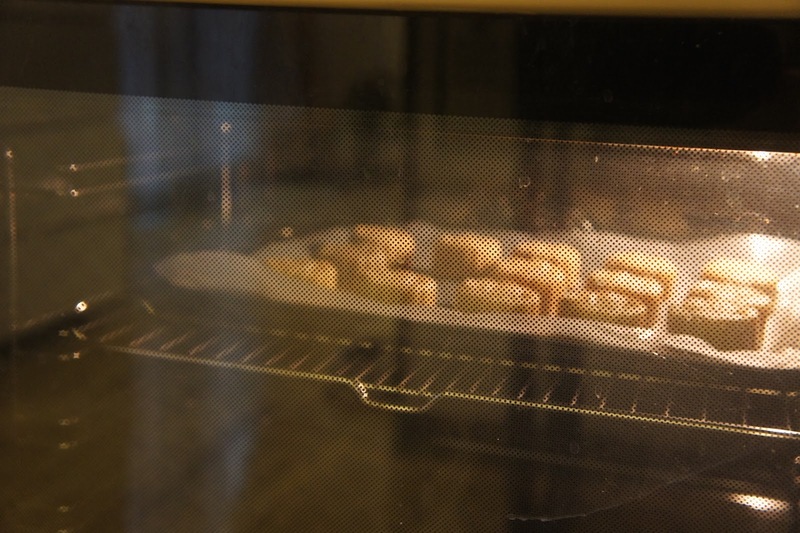 Pre-heat oven at 180 degrees celsius (356 degrees fahrenheit). When ready, bake mooncakes for 5 to 10 minutes (without egg wash) subject to size of mooncakes. 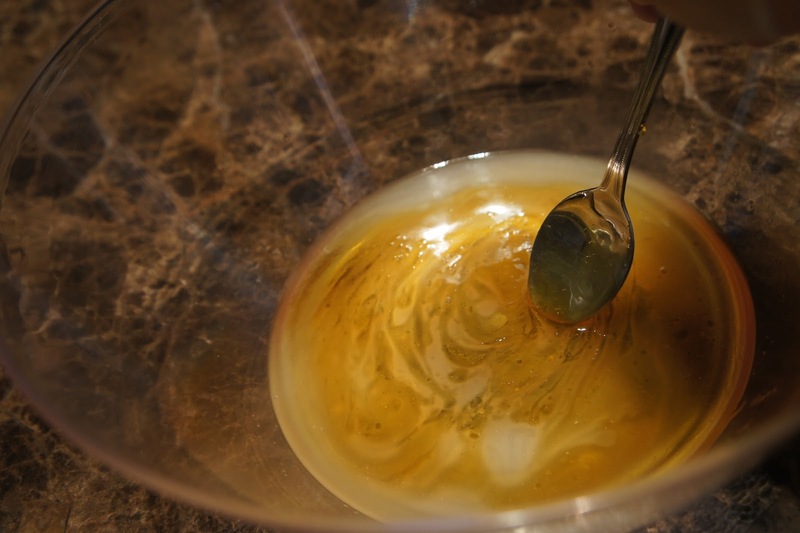 Prepare egg wash with 1 egg yolk, 2 tbsp egg white and a few drops of peanut oil. Stir well. 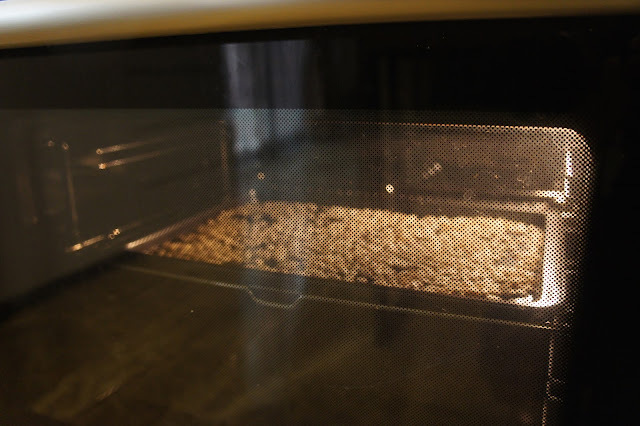 Remove baking tray from oven after 10 minutes. Let it rest for 5 minutes. Then slowly and carefully brush egg wash onto surface of mooncakes. Brush surface lightly with egg wash to avoid imprinted surfaces blurring off. 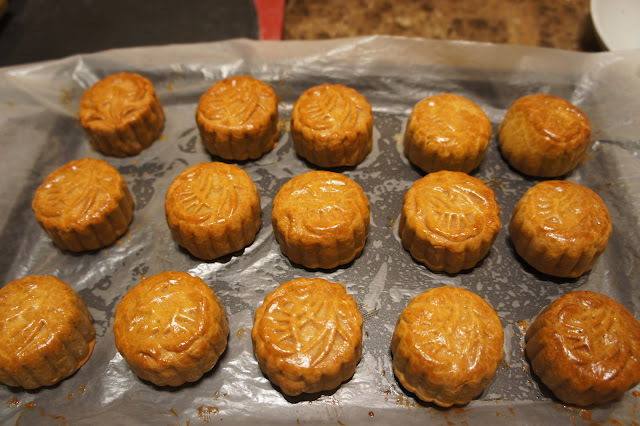 Send mooncakes back to oven for further 5 to 10 minutes after applying egg wash. Watch colour browning closely. Remove mooncakes from oven once we are happy with the colour. 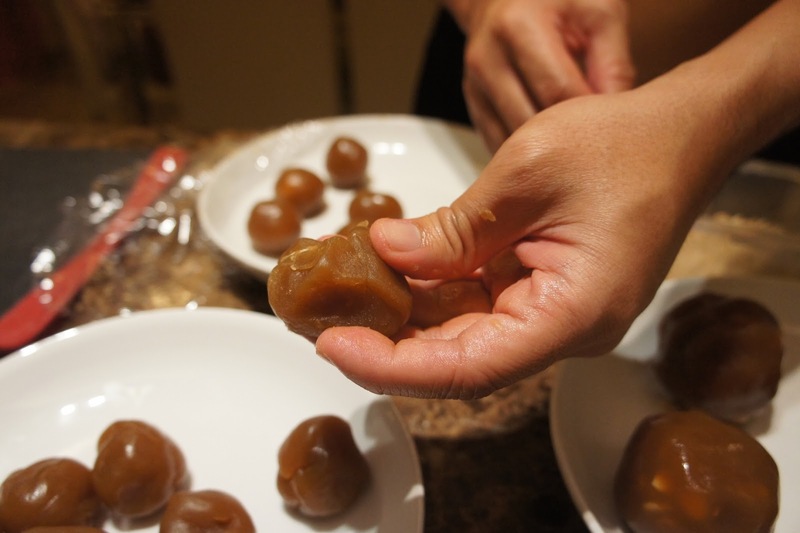 We needed no more than 5 minutes for the mini mooncakes. Allow to cool before packing or serving. 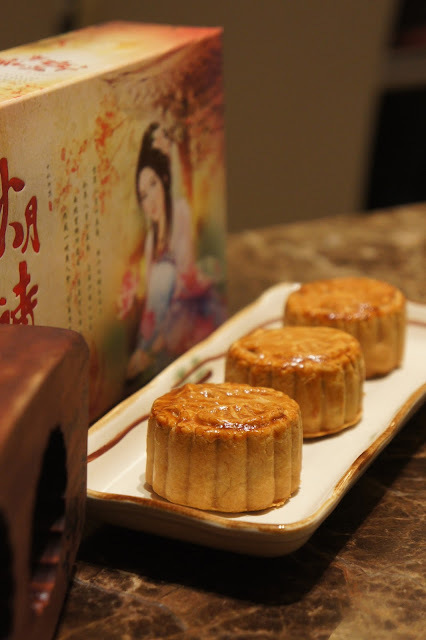 It is best to consume the mooncakes only after 1-2 days so that the crusts would turn softer and nicer in colour during the 回油 process. 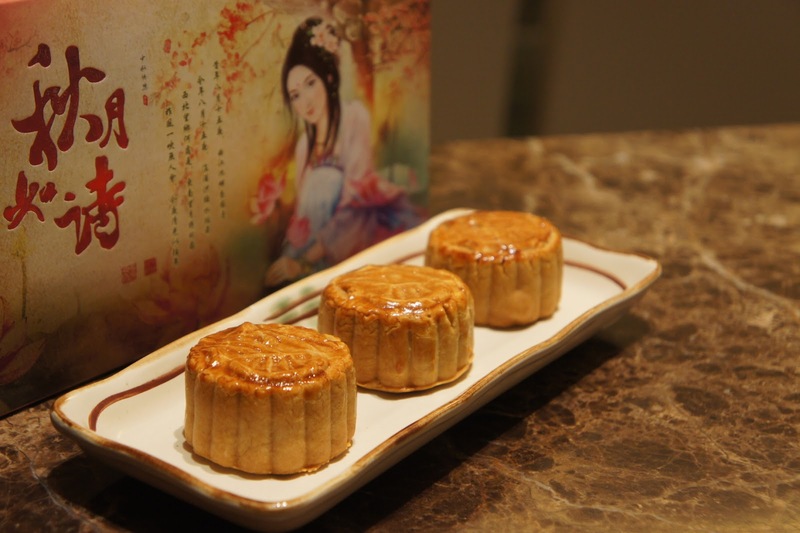 We might not have ultra thin crusts for our mooncakes, but still very happy with the end products. 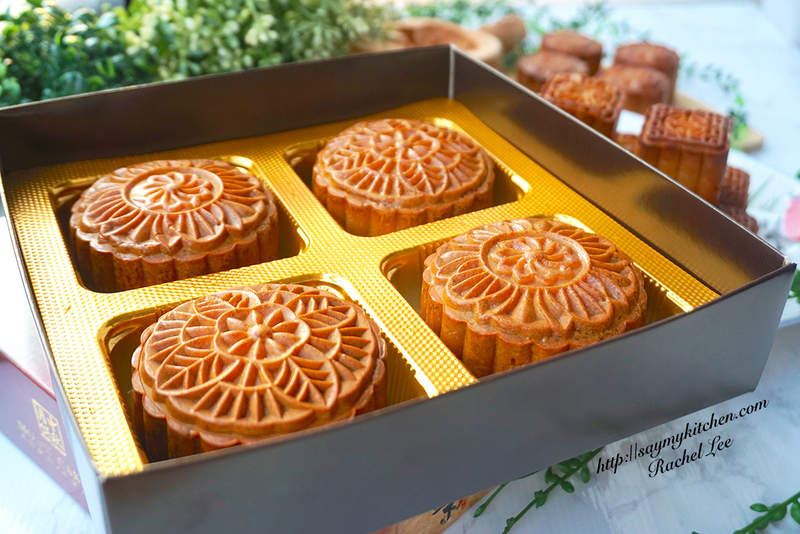 Pack the mooncakes into store bought boxes and they would be great festival gifts! 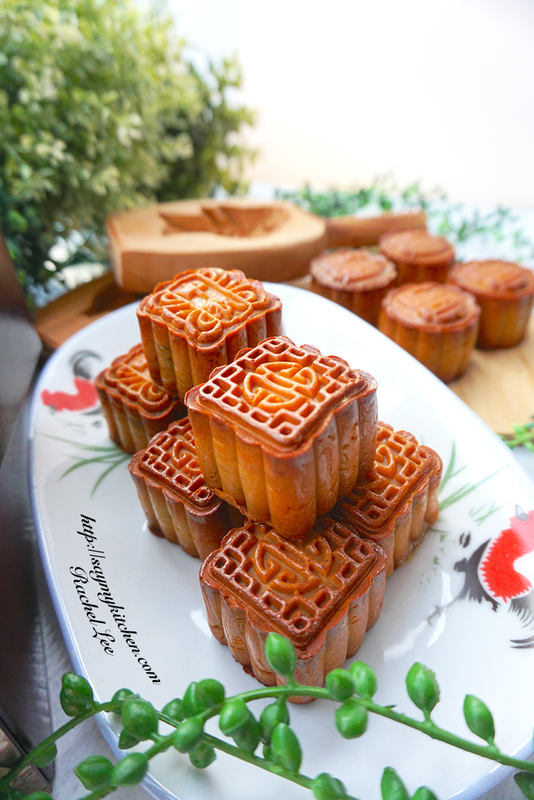 Glad to have made the mooncakes together with my husband. We were experimenting, troubleshooting and rectifying together. As he aptly puts it, it's indeed a great husband and wife bonding activity!